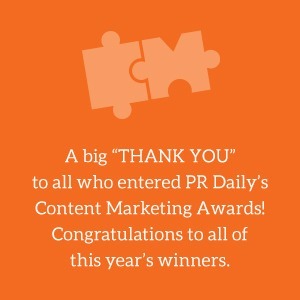 Content is king, and PR Daily’s 2017 Content Marketing Awards winners have earned the crown. They used their way with words, video, design and more to influence audiences, improve employer branding efforts, build brand awareness and much more. We’re excited to honor those who had the most successful case studies of the year. These winners will attend a Ragan event of their choice on us, earn publicity for their work and even receive a customized trophy. Keep your eye out for more great work from these industry experts. M Live Partners with Pokémaster to "Catch ’em All"
“‘My God, it’s better’: Emma can write again thanks to a prototype watch, raising hope for Parkinson’s disease"
Take a Moment, Ogilvy & Mather and Aetna Inc.
#InternYazaki, Yazaki North America, Inc.